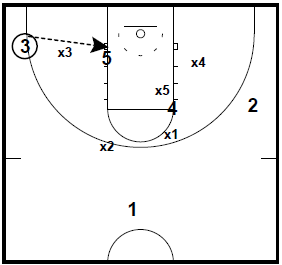 Today’s post contains two quick hitting plays that you can run against a 2-3 zone defense. Adjust these sets to fit your players and philosophy and/or take bits and pieces to combine with what you already run. 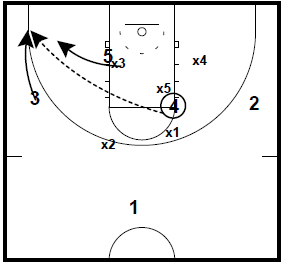 These plays are from The NCAA Best Zone Plays Playbook assembled by Wes Kosel. It is combined with the NCAA Best Man to Man Plays as this week’s featured playbook bundle. The playbooks contains 170 basketball plays from 68 different NCAA teams. 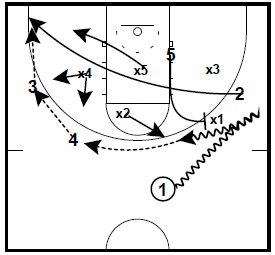 4 moves in to the middle of the zone. 1 dribbles left and passes to 3. 3 passes back to 1 and 4 moves to the right elbow. 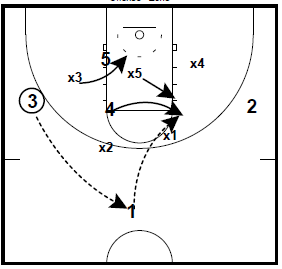 1 passes to 4 causing x5 to move up and x3 to dive in front of 5. 5 then pins x3 in. As x3 closes out, 5 may be open inside. 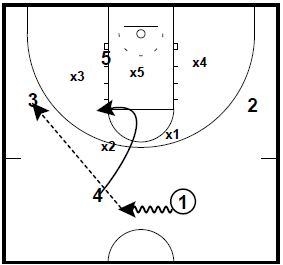 2 runs to the corner and 5 sets a ball-screen for 1. The idea is to get x2 and x4 shifted towards the ball leaving 2 in the corner for a shot.